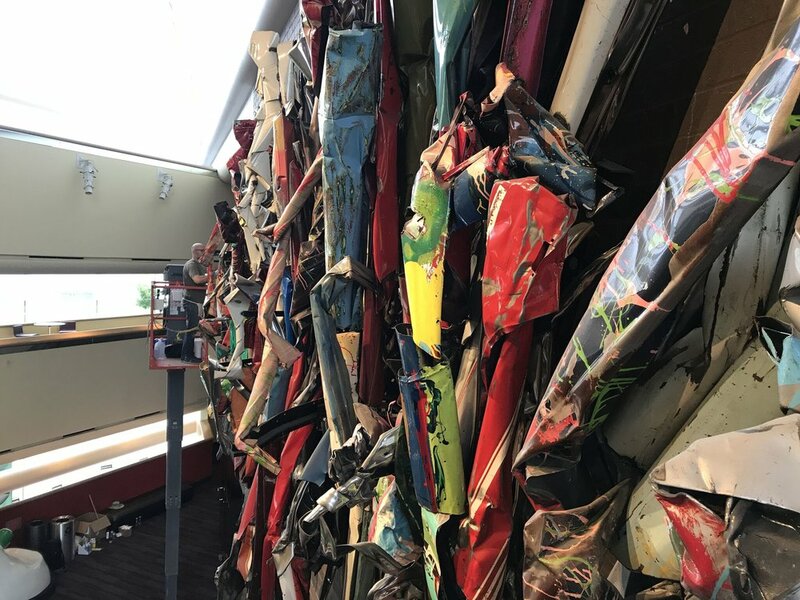 This past August, two conservators from The Conservation Center traveled to Louisville, KY to conserve the vibrant collection of public art on display at The Kentucky Center for the Performing Arts. The Kentucky Center seeks to cultivate the artistic scene in Louisville by providing programming ranging from music and theater performances to numerous outreach and education services, The permanent artworks displayed throughout The Kentucky Center feature a number of notable artists including Alexander Calder, John Chamberlain, Edgar Degas, and Joan Miro. 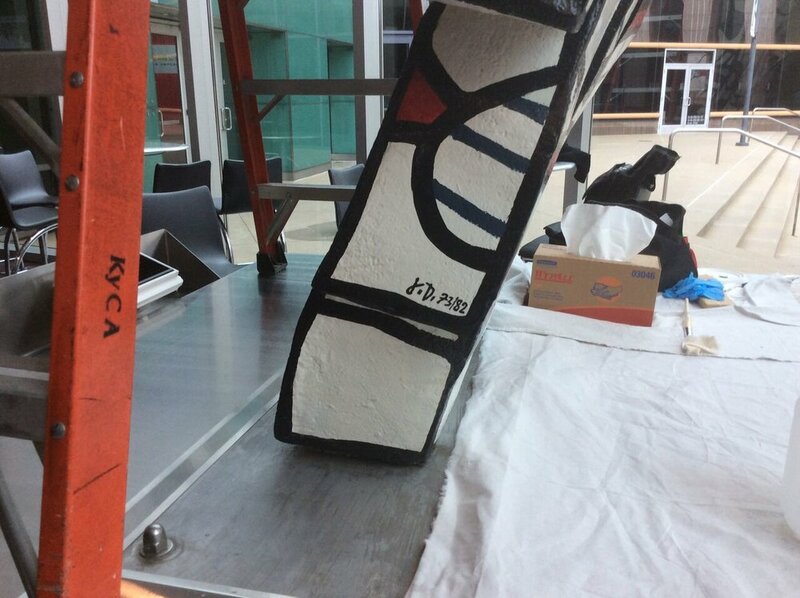 The Kentucky Center reached out to The Conservation Center to assist with the regular maintenance of the sculptures and we were excited to aid in keeping this important collection of public art in good condition. Senior Conservator Rob Kleeman and Assistant Conservator Andrew Rigsby from The Center's Furniture and Objects Departments went on-site to carry out the first phase of treatment. Treating the collection in a two-part process, our conservators began with four pieces in August. The first was Jean Dubuffet’s, Faribolus and Perceval. The work is composed of two large sculptures made of epoxy-painted polyurethane and stainless steel armatures. 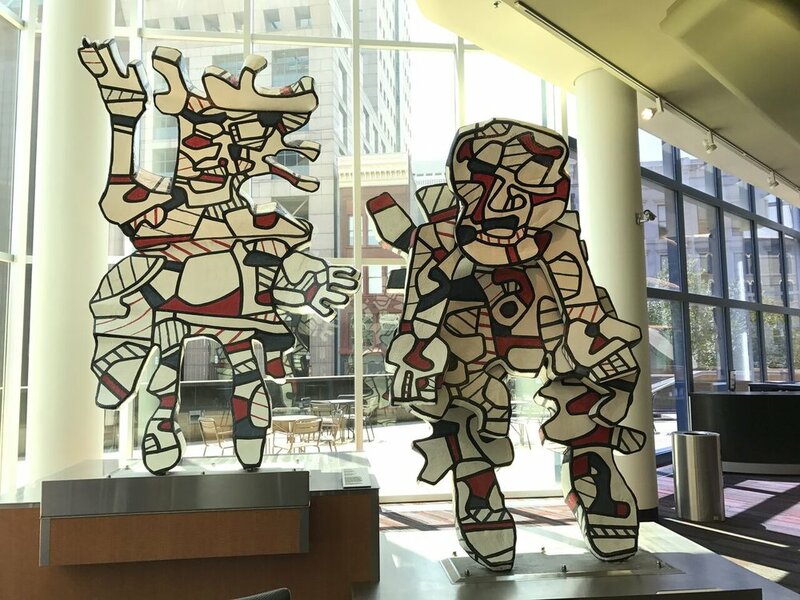 The sculptures, both produced some time between 1973 to 1982, are part of Dubuffet's Hourloupes series. While the works were in good condition, there was a layer of dust and dirt covering the surface of the sculptures. Additionally, the pieces exhibited shrinkage splits, most likely a result of time spent outside. Treatment began by removing the surface grime using distilled water and PVA sponges. A large accretion on the base of Perceval was removed and areas of paint loss were inpainted on both sculptures using reversible conservation-grade paints. A piece by John Chamberlain was next in line for conservation. Produced in 1988 and titled The Colored Gates of Louisville, this dynamic piece was constructed using painted and welded automotive steel over chrome. The sculpture was in good condition and structurally stable when conservators assessed the piece, however there appeared to be a significant layer of grime and dust on the surface. During the formal assessment, the conservation team also found areas of corrosion and minor areas of flaking paint lifting from the metal. The sculpture was first surface cleaned using a vacuum and soft brushes to loosen the layers of dust and grime. During this process, the conservators took special care to ensure that the loose and flaking lacquer was not dislodged and these areas were subsequently stabilized. The piece was then solvent cleaned using the appropriate conservation materials. 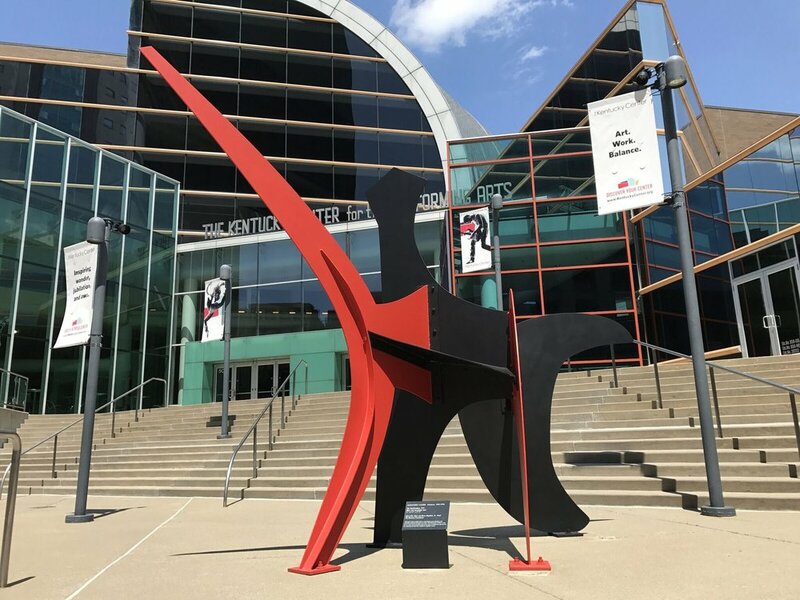 Located directly outside The Kentucky Center, Alexander Calder’s The Red Feather boldly welcomes visitors to the complex. Completed by the American artist in 1975, this piece characterizes Calder’s emphasis on movement into sculptural form. The Red Feather is fabricated with black and red painted steel and exhibited a layer of particulate film on the surface which is expected with outdoor sculptures. There were also numerous areas of small losses on the painted surface, located primarily on the bottom of the work. Working in consultation with the Calder Foundation, conservators began stabilizing the areas of loss. Once stabilized, the areas were primed and then inpainted using a foundation-approved palette. 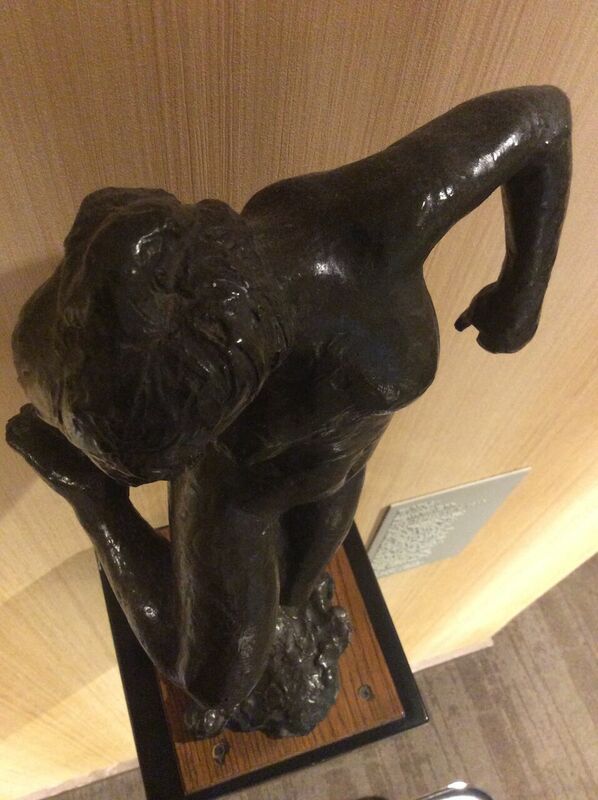 Lastly, the team treated an intimate work titled Dancer Looking at the Sole of Her Right Foot by Edgar Degas. The cast bronze piece was created in 1990 using an untitled wax sculpture found in Degas’ studio after his death in 1917. Similar to other pieces in the collection, Looking at the Sole of Her Right Foot was in good condition and exhibited a light layer of grime and dust. 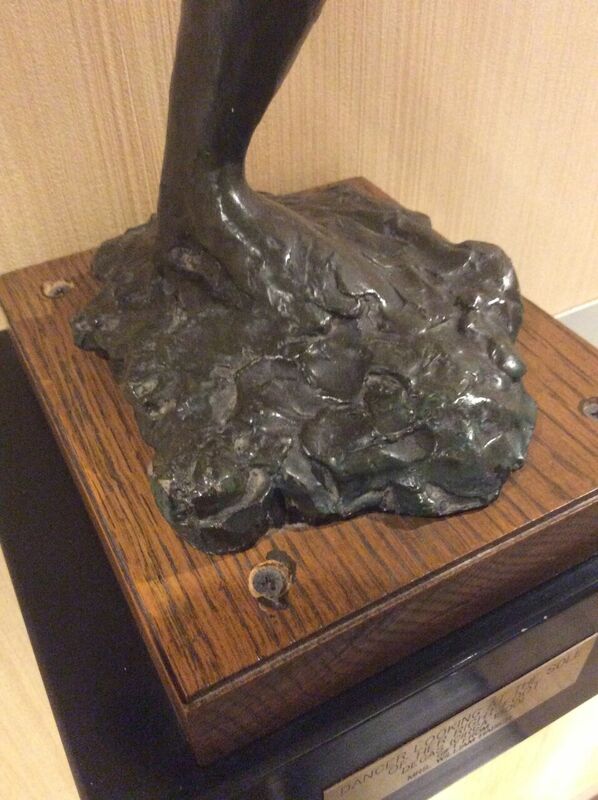 Additionally, the higher points of the sculpture’s bronze base suffered from small areas of patina loss. 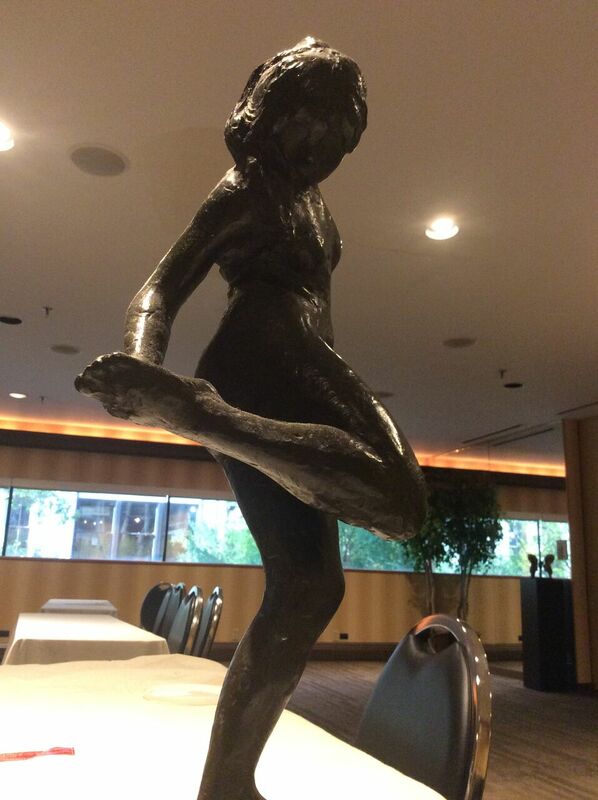 There was a crack in dancer’s foot that appeared to be a result of the casting process. To treat the sculpture, conservators cleaned the surface using a combination of dry and wet methods and then stabilized the cracking patina and crack located in the figure's foot. As a final measure of protection, a protective wax coating was applied to the surface of the piece. 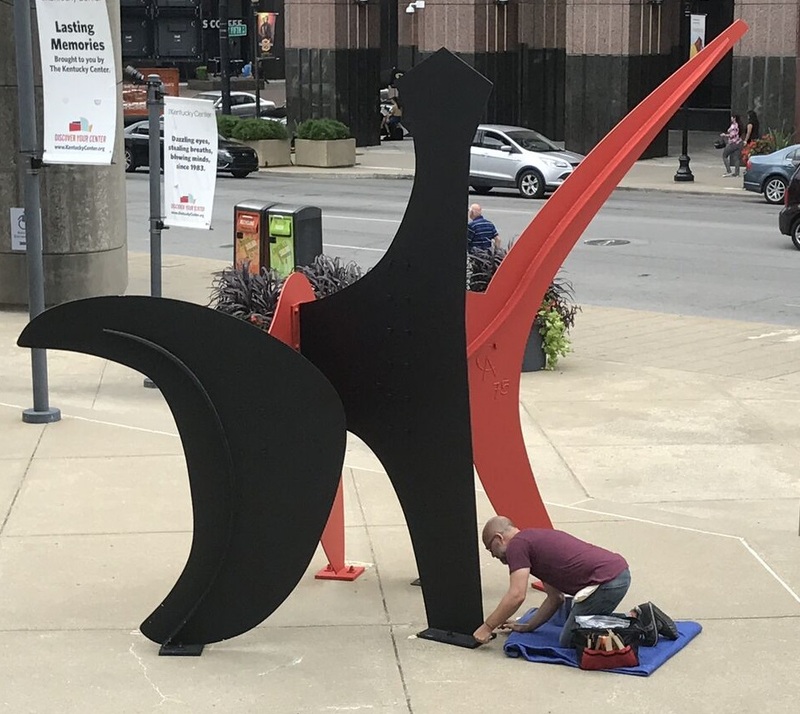 While our team was on-site, the local NPR radio station in Louisville stopped by to highlight the work being done on the sculptures and hear from our conservators! Click here to read the interview. We look forward to returning to The Kentucky Center in the Spring and completing treatment on other works in their collection. Stay tuned to hear more!